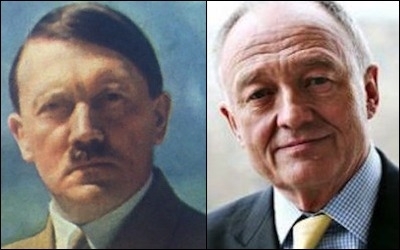 Former London Mayor Ken Livingstone (right) told the BBC on April 28 that Adolf Hitler "was supporting Zionism before he went mad and ended up killing six million Jews." Ken Livingstone, the former Mayor of London and a long-standing prominent figure on the British left, has now repeated the myth of Nazi support for Zionism. However, what was a required and standard slogan of the Communist regimes, parties and the Western far-left during the Cold War, now faces opposition from some members of the British Labour Party. That a man as prominent as Livingstone, whom the citizens of London elected as their Mayor for eight years, repeats such rubbish says a great deal about the ideas that have been circulating in what presents itself as a major cosmopolitan city. At least parts of Britain's left have sunk to the status of a provincial intellectual backwater. Livingstone and those who agree with him are oblivious of the following well-established historical facts. Hitler and the Nazis despised Zionism and did all they could to defeat it. First, Hitler despised Zionism. In fact he ridiculed the idea as he was convinced that the Jews would be incapable of establishing and then defending a state. More importantly, he and his government viewed the prospect of a Jewish state in Palestine as part of the broader international Jewish conspiracy which his fevered imagination presented as a dire threat to Germany. While (after robbing them of most of their possessions) the Nazis did allow some German Jews to leave the country in the 1930s in order to travel to Palestine, that policy was primarily driven by a desire to get the Jews out of Germany rather than to build a Jewish state in Palestine. By the late 1930s the Grand Mufti of Jerusalem, Haj Amin al-Husseini, who later collaborated with the Nazis in wartime Berlin, had informed German diplomats stationed in Jerusalem that the entry of Jews into Palestine from Germany was angering local Arabs. For reasons of their own, the Nazis cut off Jewish emigration in 1941 to pursue their goal of murdering Europe's Jews. This ignorance about the implications of the Holocaust is stunning. As the Israeli historian Anita Shapira has pointed out, it is only a half-truth to say that Israel was founded because of the Holocaust. The other half of the truth is that literally millions of Jews in Europe who might have contributed to the establishment of the Jewish state in Palestine could not do so because the Nazis had murdered them. The Holocaust itself was an enormous blow to the Zionist project. Hitler and Husseini in Berlin, November 1941. Second, Livingstone displays an ignorance of the history of World War II in North Africa. 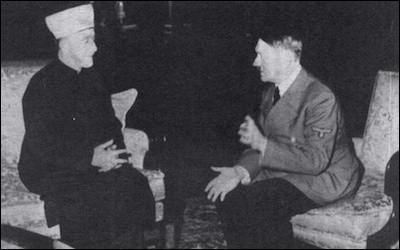 In November 1941, Hitler promised the Mufti, then in Berlin, that if and when the German armies were successful in the Caucuses, they would drive south to destroy the Jewish population then living in areas controlled by Britain in North Africa and the Middle East. In the summer and autumn of 1942, German General Irwin Rommel's Afrikakorps drove east from Tunisia to be met by forces from Australia, New Zealand and Britain at the Battle of El Alamein in Egypt. Nazi propaganda in those weeks and months urged Arab listeners to "kill the Jews," dispensing with any distinctions between Zionists and Jews. As the German historians Martin Cuppers and Klaus Michael Mallman have demonstrated in Nazi Palestine: The Plans for the Extermination of the Jews of Palestine, it was only the Allied victory at El Alamein over Rommel's forces that prevented the arrival of SS units eager to carry out mass murders of Jews in North Africa and Mandatory Palestine. Livingstone appears unfamiliar with this glorious page in the history of British anti-fascism. While actions speak louder than words, Nazi propaganda aimed both at German audiences and at Arabs in North Africa and the Middle East constantly denounced Britain, the Jews and Zionism. This Nazi flood of anti-Zionist and anti-Jewish hatred is documented in my book Nazi Propaganda for the Arab World, which the leaders of the Labour Party really ought to read. Nazi propagandists claimed that a Jewish state in Palestine would be a "Vatican for the Jews," that is a power centre of an international Jewish conspiracy and thus a threat to Germany. They also argued that an Allied victory would be a victory for the Jews. They repeated lies that a Jewish state in Palestine would be a threat to the religion of Islam in the entire Arab Middle East. Zionism was described as a form of "Jewish imperialism" that was linked to British and American imperialism, and even to "Jewish Bolshevism" in Moscow as well. In the postwar years, neo-Nazis and Islamists in the Middle East viewed the establishment of the state of Israel as confirming these Nazi anti-Semitic conspiracy theories. In short, in both word and deed, Nazi Germany did all it could to ensure that a Jewish state in Palestine never would emerge. 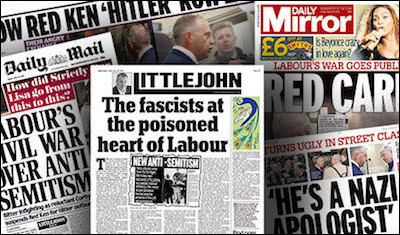 The British media is shocked, shocked to find that anti-Semitism is going on in the Labour Party. Livingstone appears ill-informed about the decisive role that British anti-fascism in World War II played in defeating Nazi Germany's efforts to murder the almost one million Jews of North Africa and the Middle East. One of the great successes of the Cold War propaganda campaigns waged by the Soviet Union, its Warsaw Pact allies, Arab states most hostile to Israel, as well as the Palestine Liberation Organization was its suppression of the actual history of Nazi anti-Zionism and even the role the Soviet Union played in helping to defeat it. In the immediate postwar years, before Soviet leaders sought to drive out Western influence in the Middle East and gain control over Western Europe's supply of oil from the region, the Soviet Union supported the establishment of the state of Israel. After the "anti-cosmopolitan purges" of the early 1950s, the history of Soviet Zionism became as embarrassing as the actual history of Nazi anti-Zionism. Neither fit into the dogmas of Communist anti-imperialism, which, it appears, have now filtered into some ranks of the Labour Party. Anti-Semitism, like all forms or racism and religious hatred, is built on lies and distortions about the past and present. Around the world, London stands for worldliness, cosmopolitanism and often for an understanding of history. When the former Mayor of this city reveals how little he knows about World War II and Britain's role in it, one has to wonder what has happened to the qualities we admire in British intellectual life.